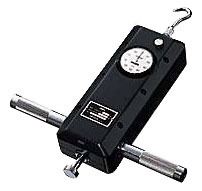 The Imada ESH/PSH series mechannical force guage is designed for high capacity measurements from 200lbf up to 500lbf (300 kg). The rugged metal housing and heavy-duty springs will withstand the harsh rugged environment of a manufacturing plant, yet the highly accurate, matched springs will ensure reliable results and retain their accuracy over long periods. The tare ring allows you to zero the gauge and compensate for measuring attachments and changes in measuring position. The real time/peak hold selector switch enables you to observe transients or capture peaks. ESH/PSH/ force gauges are available in lbs, kgs, and Newtons. Sold in kit form complete with force gauge, hard plastic carrying case, handles, measuring attachments (ESH includes hook and flat head- PSH includes flat head, conical, chisel, notched and small hook) and extension shaft. For installation bolts are also included for maounting the gauge to a test stand or permanent location.